Today I saw that the satirical newspaper The Onion had this radio news "story" about the International Star Registry accidentally re-naming the Sun "Margaret." Several companies claim to let you buy or name a star for a fee, and we astronomers are often by customers of these companies if we will use their names or take a picture of their star. The answer is always "no," for various reasons. Although companies "selling" stars or star names likely do keep track of who has named which star what, these names are unofficial. Research astronomers call objects after names approved by the International Astronomical Union. Outside of objects in our Solar System and stars with common names (like "Polaris" or "Betelgeuse"), stars and galaxies don't get anything approaching real names. They get names based on either the catalogs that list the stars and galaxies (such as Gleise 581, the star recently announced to have an Earth-like planet) or based on their coordinates (like PG 1115+080, a gravitational lens near the coordinates RA=11hr 15min, Dec = +8.0 deg). When you send money to a company selling stars, you are buying a product from them. Often it includes a certificate, a sky map with your star marked, and maybe some information on stars. If you give the company a name, they keep it on record, sometimes promising to publish the names in a book. But you are not doing anything official, and often what you are getting may not be worth the money. Let me give you an example. One year, a family member thought it would be neat to give me, an astronomer, a star. I thanked them profusely, and then named the star something like my "Totally Bogus Star." I refuse to say which company it was from, though. The certificate I received came with coordinates of the star, as well as a star map. So, for fun, I went and looked the coordinates up in our catalogs. There was nothing at those coordinates! I tried several variations on the coordinates (perhaps the coordinates were old, or perhaps the star was moving fairly rapidly), but nothing came up. Finally, I tracked down the star circled on the star chart. It was pretty far away from the stated coordinates! And, as I knew it would, it already names from several catalogues produced in the late 19th and early 20th century. I can guess what happened to the coordinates. The sky chart was printed out from some popular astronomy software; the software allows you to see coordinates of a spot by moving your mouse around on a star map on the screen. I suspect somebody just read those coordinates off. They were close, but not nearly as accurate as real star positions are known to be. But the only thing that angered me was a booklet on stars sent with the certificate and star chart. It was full of horrible factual errors. It was clear that whoever wrote that booklet did little if any research into what they were writing, and certainly had no editor checking their facts. I find this upsetting, because (a) many of the errors are so outrageous that the tiniest bit of research would catch them, and (b) most of the people who read the schlock are not going to know that it is wrong, and in fact are probably more likely to believe it because it comes from an "authority," a company that deals in stars. If you have "bought" a star or are thinking of doing it, I won't tell you not to do it. But realize that what you are getting is not official naming rights for a real star. In fact, much of what you are getting is likely very cheaply produced with little oversight or care about quality. For the price that these stars cost, you deserve better. In a fairly big news story today, Swiss astronomers announced that they found an Earth-like planet orbiting a red dwarf star. The news stories are speculating about water and life on this planet. But let's step back just a bit before we start planning the State dinner for the ambassador of Gliese 581c. First, let's look at what we know for certain. Gliese 581 is a red dwarf star -- a star smaller and cooler than the sun. Gliese 581 is about 21 light-years away and was already known to have a Neptune-mass planet (Gliese 581b) orbiting the star every five and a third days. Astronomers knew this because the star is wobbling as the gravity of Gliese 581b pulls on it, and we can measure this wobble. But one planet didn't fully explain the observed wobbles. After more observations, the European astronomers figured out that the system must also have a planet at least five times the mass of the Earth orbiting the star every 13 days. Really, that is all we know. Anything else is guesswork, though these guesses have some scientific basis and are not just idle speculation. If the Gliese 581c is made of rock, its diameter will be about 1.6 or times that of the Earth, and the pull of its gravity will be about 1.6 times stronger than that of the Earth, meaning that if you weigh 180 pounds on the Earth, you'd weigh 290 pounds on Gliese 581c. However, it could be made of ice, and therefore be larger, or it could have a lot of gas (like Uranus or Neptune), in which case it could be quite a bit larger. We don't know. We also know that, at the distance that Gliese 581c is from its parent star, it lies in a "sweet spot" where temperatures are just about right for water to exist as a solid, liquid, and a gas, as it does here on the Earth. Scientists call this the "Habitable Zone," since life as we know it could live there. However, just because a planet is in the Habitable Zone around a star doesn't mean the planet could support life. Maybe it doesn't have any water. Maybe it has an atmosphere like Venus and is a thousand degrees on the surface. Maybe it doesn't have an atmosphere at all. We don't know. Another issue with Gliese 581c is that it is so close to its parent star that the same side of the planet almost certainly faces the star, just like the same side of the moon always faces the Earth. This would make one side of the planet fairly hot, and the other side frigid cold (although an atmosphere could help mitigate this effect). It may be that all the water on the planet is locked in giant ice caps on the side of the planet away from the star. We don't know. In short, Gliese 581c is a very interesting discovery, and the astronomers who found it have made a very important find. But the find illustrates how little we know about planets in other solar systems. It will likely take years before we learn much more about Gliese 581c, and it may be decades or longer before we can ever separate its light from the light of its parent star (separating the light would make it easier to study its atmosphere). But you can be certain that astronomers will continue to study this planet and to search for more and more Earth-like planets around other stars! Today's Astronomy Picture of the Day is our first ever three-dimensional picture of the sun. You'll need some red-blue 3D glasses to see it (I got mine from a McDonald's Happy Meal a few years ago, so they don't need to be expensive!). Why do we need a 3-D view of the sun? From the Earth, the sun looks like a flat disk. We know it is spherical, and when we see a sunspot or activity of the sun, we can make a decent guess as to where it is based on our model of the sun. 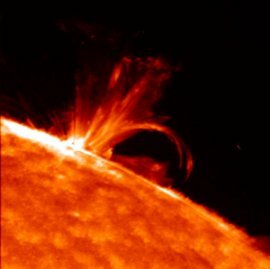 But many things stick out from the surface of the sun, like prominences, flares, and the solar corona. And when we see a solar flare or coronal mass ejection, it is a bit of a guess if these storms are headed for the Earth. With the newSTEREO spacecraft, it should be possible to make better predictions as to if a solar storm is going to hit the Earth. And, since solar storms can disrupt radio, damage satellites, endanger astronauts, and even cause power outages, these are important advances in predictions of solar storms. So, grab your 3D glasses and enjoy a safe look at the sun online! Today, this story from Space.com suggests that cosmic forces shape life on Earth. No, I am not talking about astrology, the pseudo-science that claims (falsely!) the stars control our destinies. The article claims that, in the fossil record, there appears to be a period of about 62 million years to major changes in life on Earth, and that this time period matches the period of one cycle in the sun's orbit around the Milky Way. To go further, we need to understand how the sun orbits the Milky Way. The Milky Way is mostly flat, shaped like a Frisbee or a dinner plate, though it does bulge a little in the middle. We call this Frisbee part of the Milky Way the disk. The sun lies about two thirds of the way out from the center of the Milky Way, and for the most part traces a circle about the middle. However, the sun also moves up and down, like a bobber in water. This is because the disk of the Milky Way isn't empty, but consists of stars and gas, each of which has its own gravity that pulls and tugs on the sun and our solar system. The amount of time it takes the sun to bob up and down once is about 62 million years, about the same length of time as the changes in life on Earth. Now, when the sun moves up out of the disk (or "north"), it is moving in the same direction that our whole galaxy is moving. When the sun moves back down (or "south"), it is moving in the opposite direction. The scientists in this study claim that, when the sun is moving north, it moves out of the Milky Way's magnetic field, which helps to shield cosmic rays coming from other galaxies. If this is true, then the increased cosmic rays could spur changes in life on Earth. Is this true? Maybe, but I remain skeptical. We know very little about the shape of the magnetic field of the Milky Way, and how far it extends into space. We know even less about how much cosmic radiation this magnetic field shields us from. And we don't know exactly how long it takes the sun to bob up and down once, or how much this bobbing might vary from one bob to the next. But this is how science is done. The new study proposes an explanation for something we observe. Now it needs to make a prediction about something we don't yet know the answer to. If, in the future, that prediction holds up, then the hypothesis that the sun's bobbing motion affects life on Earth is made a little stronger. If that prediction fails, then the hypothesis is less likely to be true. Once in the past, a scientist named Milutin Milankovich proposed that the Earth's ice ages were due to natural cycles in the exact shape of Earth's orbit. He predicted that, as the ice ages were more precisely dated, these cycles should match ice ages exactly. The idea was radical and not accepted by a lot of scientists until it was found that the timing of the ice ages follows these cycles with very high precision. Now, Milankovich's theory is well accepted by many climate scientists and planetary scientists. So, it may end up that many extinctions and changes of life on Earth are due to this bobbing motion. Similar hypotheses have been made before, but these were not able to make testable predictions, a vital part of any scientific theory. We shall see! This morning I received an email from colleagues saying that Bohdan Paczynski (pronounced puh-CHIN-skee), an astronomer at Princeton, died yesterday. I never met Paczynski, but I am certainly very aware of his large body of work. Paczynski studied gravitational lenses, gamma ray bursts, and other high-energy physics. It is sad to hear of his passing, and a great mind has been lost. You can read a biography of Paczynski from Wikipedia, the Astronomical Society of the Pacific, or his web page. Image credit: NASA/CXC/IoA/A.Fabian et al. Yesterday was a day full of meetings, most of them useful but boring. But one was our weekly colloquium, where an astronomer comes in (usually from outside the University of Texas) and talks about his or her research work, and it was quite interesting. It involves a problem that not too many people outside of astronomy have heard of, but is a big mystery -- the mystery of "cooling flows." Cooling flows exist in large clusters of galaxies, such as the Coma Cluster. In between the galaxies in galaxy clusters, a very hot gas, tens of millions of degrees, permeates the otherwise empty space. This gas is invisible to human eyes, but it radiates a lot of light in the X-rays. 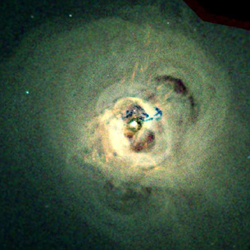 Like anything hot, the gas in galaxy clusters is cooling off. In some clusters, it is cooling so quickly that we should be able to see it changing from hot gas to cool gas and into stars, which should cause the galaxy at the center of these clusters to form stars at a rate a hundred times that of the Milky Way. But the galaxies in these clusters don't show new stars -- they are all very old. The only explanation for this is that something is heating the gas up again before it gets too cool. But what? Most people think it has to be a giant black hole, billions of times the mass of the sun, at the center of the galaxy cluster. These black holes are known to exist, and they often shoot giant plumes of gas and particles a million light-years or more into deep space. These black holes should produce enough energy to heat the cooling X-ray gas. A few years ago, the Chandra X-ray Observatory found giant bubbles blown in the X-ray gas by the central black hole. The picture at the top of this post is one such galaxy cluster, and you can see several bubbles. The thought is that these bubbles, which contain a lot of energy, dissolve (or "pop") and release all of that energy into gas, perhaps as heat energy, or perhaps as sound waves. The talk yesterday by astronomer David De Young was technical, but it dealt with the physics behind these bubbles. And, strangely, the physics seems to show that these big bubbles don't want to pop -- they want to stick together and slowly float off out of the galaxy cluster, kind of like a blob in a giant lava lamp. And if the bubbles in galaxy clusters do that, they don't transfer their energy to the X-ray gas. And so the mystery remains as to why the gas stays hot. Maybe the physics used to explain these bubbles isn't complete -- we don't yet have the computing power to determine what happens in these bubbles over very long times, so the physicists have to make simplifying assumptions. Perhaps the black holes also emit energy in forms other than the giant bubbles, and that energy is what does the heating. We really don't know. And so, the mystery surrounding some of the most energetic things in the Universe -- giant black holes at the centers of giant clusters of galaxies, remains. Image credit: NASA/JPL-Caltech But what should we think when human errors doom a spacecraft? On Friday, NASA issued the final report on last November's loss of the Mars Global Surveyor spacecraft. The probe had been studying Mars for seven and a half years, almost four times longer than its planned lifetime of two years, when it fell silent. 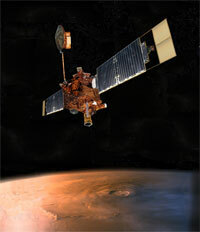 NASA's report finds that a series of software errors (human programming errors) led to the Mars Global Surveyor's loss. If it hadn't been for these errors, MGS would probably still be working just fine! Yet I don't think it is right to get very upset about these mistakes. The mission was only designed for two years. Software updates are going to be necessary beyond that. Some electronics are damaged by radiation, so workarounds need to be devised. Also, as robotic spacecraft get older, mission planners allow for riskier operations, if such risks will net us science that cannot be done otherwise. Again, new software is needed to allow for those operations. And eventually some bugs are going to slip through. Most importantly, though, no human lives were endangered. Human errors are often the cause of death of spacecraft. In many cases, the spacecraft have far exceeded their lifetimes, and the current programmers were not even out of school when the spacecraft was launched. An example of this is the ROSAT X-ray telescope, which operated from 1990 to 1999. Its mission ended when, down to one gyroscope (which made pointing very hard), it was accidentally commanded to slew the camera over the sun. Other times, human errors are less forgivable, because they occur before a spacecraft has completed its mission (or even started). These errors should have been caught, as the early parts of missions are thoroughly scripted and tested time and time again. Errors in this case include the losses of the Mars Climate Orbiter when it tried to go into orbit around Mars, which happened when NASA was using standard metric units (kilograms, kilometers, etc.) to run the spacecraft, but the spacecraft's builder, Lockheed Martin, used imperial units (pounds, inches, etc. ), and nobody caught the mismatch. The Mars Polar Lander was lost when it was landing on Mars because software told the engine it had landed when it really was tens of feet above the surface and just extending its landing gear. Existing checks should have caught both of these errors before the spacecraft were even launched; instead, hundreds of millions of dollars were lost. NASA is hoping to learn from the mistakes that doomed the Mars Global Surveyor in order to prevent such errors in the future. My guess is that human error will result in the loss of more spacecraft, but if we can learn from these mistakes, perhaps we can eke out more science from each robot before it is lost. As part of our public outreach, astronomers often visit schools to talk about space and science. One common exercise when dealing with younger students is for the teacher to ask students draw a picture of what they think an astronomer looks like before the astronomers come to the classroom. 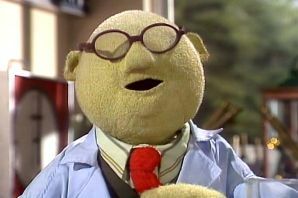 The vast majority of these portraits look something like Dr. Bunsen Honeydew (pictured above) -- male with glasses and labcoat. This misconception is carried not just by children, but by many adults, too. Most astronomers don't wear labcoats (unless we are working in the lab on an instrument that requires a labcoat), and not all of us wear glasses. But, more importantly, not all of us are male. Science, especially physics and biology, is often viewed as a male-dominated career. In some ways this is true, although women have made vital contributions to astronomy for centuries. A lot of the work of the famous 18th-century English astronomer William Herschel was assisted (and often directed) by his sister Caroline, and many vital astronomical discoveries of the 20th century were spearheaded by women. Unfortunately, women still lag behind men in reaching the highest positions of astronomy. Although women make up over 30% of the graduate students in astronomy, but only around 15% of astronomy professors are women. This is despite the fact that the astronomical community has been trying to address this inequity for nearly 30 years. While some advances have been made, women still do not have appropriate representation in the advanced stages of the career. What is the reason for this discrepancy? I don't know. Although change is slow in the academic world (due to the slow turnover of jobs), the pace of observed change is still lagging far behind where it should be. The American Astronomical Society's Committee on the Status of Women in Astronomy continues to work to better the standing of women in astronomy. It is my sincere hope that the imbalance can be corrected sooner rather than later. One of my goals in this blog is to talk about the daily life of astronomers.A lot of people have an idea that we sit by telescopes on mountains. Ah, if only life were that glamorous (and I'm not sure that living the life of a hermit on a mountain is glamorous). Most of our time is sent in front of the computer, scrutinizing plots and numbers, and rarely stepping back to look at the really fantastic objects we are working on. But this week is even more un-glamorous than that. I am working on calibrating pictures of star fields. I want to know exactly how bright every star in my digital image is. It's fairly easy to measure how bright they are in comparison with each other, but I want to be able to compare these stars with stars across the sky. It's a little like using an old balance scale. You can compare how heavy different objects are by putting them on opposite sides of the scale. But if you want to know how heavy something is in pounds (or kilograms), you need a set of measured weights. And if you want to be precise, you have to make sure that those weights are in pristine condition -- any nicks or cuts in the weights mean that a tiny amount of matter is missing. And you have to trust those measured weights, and hope that they truly weigh what they claim to weigh. Likewise, with measuring star brightnesses, we have to use stars of know brightness to put things on the same scale. And tiny things can mess up our measurements -- perhaps there are some very thin clouds covering parts of the sky -- these will make stars appear slightly fainter than they really are, and we may not see those clouds. Or maybe the star we are using as a standard brightness indicator hasn't been measured as well as we would like. Or any one of a multitude of problems. This work is boring, tedious, tiring, and less fun than watching paint dry or grass grow. But it is a crucial part of our work, because we can draw wrong conclusions if we are off by even a few percent. I won't bore you daily with details of each day's work, as this may take a while. In one of this week's installments of the comic strip Mallard Fillmore, the strip claims thatglobal warming is being caused by the sun, and it cites two sources -- National Geographic news, and the Danish National Space Center. But reader beware. I haven't found a reference in National Geographic or on their website that claims the sun is causing global warming (I did find one article that claims the opposite), but that doesn't mean that a news story to that effect isn't buried somewhere. Meanwhile, the Danish Science Center does report that the sun is responsible for some global warming, but on the same page, they go on to say "That there exists a significant contribution from solar activity variations to global temperature increase does not, however, exclude other contributions to the rising global temperature, natural as well as human." So, does the sun contribute to global warming? Yes, to some extent -- the latest numbers I hear are that the sun may cause, at most, 25% of observed global warming. But that leaves 75% to be accounted for, and the answer is unambiguously that people are responsible for most, if not all, of that. In February, scientists released a report that states that global warming is occurring and that humans are responsible. Among climate scientists, there is no significant debate about these facts. Yes, you will always be able to find some scientists who disagree. But the vast majority of scientists agree that humans are the primary cause of global warming. In fact, if anything, the February report likely understates the evidence for human impact on the climate. This is because the scientists had to get unanimous approval of politicians before issuing the report, including politicians from governments that ignore or downplay global warming, such as the U.S. and China. Today, a second in a series of reports on global warming was released. This report details how scientists believe global warming will impact the environment, including impacts on humans. Yes, much in this report is speculation, but it is informed speculation based on nearly 29,000 separate data sets, climate models, research reports, etc. This isn't idle speculation -- it is a prediction. And again, political pressures forced the report to be watered down from what scientists truly believe. The facts are that global warming is occurring, people are the primary cause, and the effects of ignoring global warming are dire for people as well as the environment. But let us be positive -- we can stop it, and without massive, sudden changes in our lifestyles. In fact, the sooner we start to change, the less drastic any human action has to be! The more we put off changes, the more drastic we will have to change in the future. History shows that humans can change and make positive impacts on the environment. When I was in high school, the ozone hole was a big scare. Chemicals used by humans were causing a hole to develop in the ozone layer, and that hole was growing from year to year. We banded together as a species and stopped most production of those chemicals, and now the ozone hole is stabilized, and in some years appears to be shrinking. In the 60s and 70s, smog was a major problem in most major U.S. cities, but emissions controls on cars and industry has greatly reduced (though not eliminated) the problem. We have also eliminated or reduced many of the most pressing threats to our water supply through the Clean Water Act. And when certain pesticides were threatening many birds and other animals with extinction, we eliminated most of that threat. In none of these cases did we have to give up our way of life -- we made changes, sure, but the economy was not plunged into an endless depression, most of us in the U.S. still have our own cars, and our food supply has not been decimated by insects. The same can be true for global warming. There are changes that we can and must make that will cost money and will be inconvenient, but, in the grand scheme of things, these changes are minor. First and foremost, we must reduce our use of fossil fuels and change to become completely dependent on renewable resources. This can be a gradual change, occurring over decades, but we must start that change. Energy efficiency can start with very simple changes. Replace normal incandescent light bulbs with compact fluorescents. During the summer, let the temperature in your house be one or two degrees warmer. If you have a use for a truck or SUV, that's fine. But also own a smaller car that you use when you don't need the carrying capacity of a larger vehicle. Shut down your computer when you are not using it. These steps are small and won't solve the problem, but they are a beginning. We can be reasonable about our response to global warming -- we don't have to regress back to Stone Age technology. But we do have to get started. And the sooner we get started, the less dramatic the impact on our lives will be. Let's give the poor sun a break, admit that we are causing major and negative changes in the Earth's climate, and start working on solutions. Added on April 9: The web site for the UN taskforce on global warming, the Intergovernmental Panel on Climate Change, is here. This week is a week of holy days for people of the Jewish and Christian faiths. For Judaism, the Passover celebration began last night; for Christians (both western and eastern), Easter is this Sunday. The exact days change from year to year. Why? The Jewish calendar is based to a large extent on the moon. The moon completes a cycle of phases every 29.5 days; twelve "moonths" (or lunar months) add up to a bit over 354 days. Note that this is 11 days short of a normal, or "solar" year. So, the Passover celebration, which occurs in the Jewish religious month of Nissan, can shift with regard to the Gregorian calendar that we all use. Every few years, an extra month has to be added to the calendar to keep the lunar calendar in line with the sun, so that the Passover celebration always occurs in the spring. The date of Easter used to be fixed to the date of Passover, since the Christian holiday is based on events that occurred during the Passover celebration. More recently, the date was changed so that Easter is the first Sunday following the first full moon of spring. In western Christianity, most years the two holidays coincide. In eastern (orthodox) Christianity, due to vagaries of different calendars used, the Easter celebration is often a lunar cycle later (though this year they coincide). There are many other calendars based on the lunar cycle. The Islamic calendar sticks very precisely to the lunar cycle, so dates of Islamic holidays drift with respect to the seasons. Most other lunar calendars have an extra month added in now and then to try and keep track with the seasons. Calendars are all, to some extent, artificial. There are not an even number of days in a lunar cycle (or in a year, which is why we need leap days now and then), there are not an equal number of lunar cycles in a year. But for the purposes of time keeping, a day, a lunar cycle, and a year are natural divisions of time if you don't have watches and calendars. In fact, in many ways the Gregorian calendar that we use is even more arbitrary -- a month doesn't follow the lunar cycle, and the lengths of the months vary from 28 to 31 days in an irregular fashion, and every 4th year (except every 100th year, except once again for every 400th year) we add an extra day to our calendar. If you are celebrating holy days this week, a happy Passover or happy Easter to you all. And, even if you aren't celebrating, you know that the full moon is this week, so go out in the evening and enjoy the big yellow moon. Friday was a day that many observational astronomers dread. It was the day that the time allocations on the Hubble Space Telescope were announced. Some of you may remember my writing about this proposal back in January. I submitted a proposal, and 12 hours later, Hubble's camera that I had asked to use quit working. Because so much of the time astronomers asked for used this camera, and because the deadline had just passed, NASA extended the deadline for a couple of weeks. Two weeks ago, while I was learning about exploding white dwarfs, dozens of astronomers met in Washington, DC to choose which of the proposals would get time on the Hubble telescope. It was a tough job, as astronomers asked for over five times more time than was available. And this was after some large programs were knocked out because they required the now-defunct camera! When so much time is requested, it is inevitable that perfectly good requests are denied. So, I felt absolutely ecstatic when I learned that I was granted Hubble time. For the first time ever. And I was worried that I was asking for a lot of time, which can hurt a proposal. It may be 15 months before my images are taken, and I have to keep my fingers crossed that nothing else breaks before I get my data. On the good side, at the end of the next 15 months, astronauts should be up fixing the Hubble one last time.